The Target Saver: Just FREE Stuff: Enter To Win A Playstation 4 Call Of Duty Bundle! 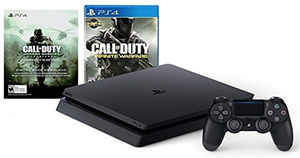 Just FREE Stuff: Enter To Win A Playstation 4 Call Of Duty Bundle! Head over to enter to win the Just Free Stuff Playstation 4 Call Of Duty Bundle Giveaway. Visitors will need to enter and then verify their email. One Time Entry. Expires May 31, 2017. U.S. and Canada Only. Let us know if you win!